The following Joint Publication is unavailable from the Defense Technical Information Center (DTIC) website. 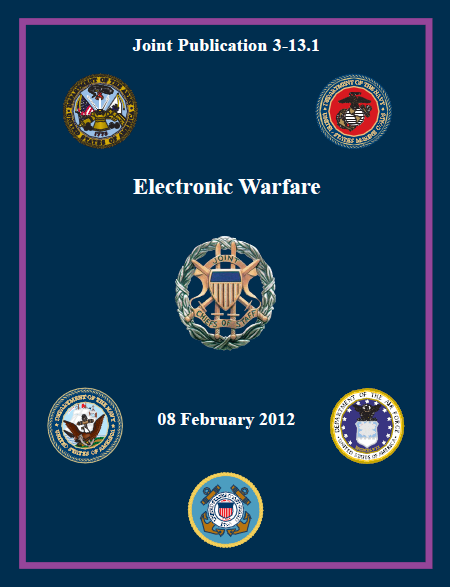 Though it does not have any markings indicating a distribution restriction, the DTIC website lists the document as being available through the Joint Doctrine, Education, & Training Electronic Information System (JDEIS) which is restricted to U.S. military personnel. A previous version of this publication from January 2007 was made available by the Federation of American Scientists. All modern forces depend on the electromagnetic spectrum (EMS). The military requirement for unimpeded access to, and use of, the EMS is the key focus for joint electromagnetic spectrum operations (JEMSO), both in support of military operations and as the focus of operations themselves. Electronic warfare (EW) is essential for protecting friendly operations and denying adversary operations within the EMS throughout the operational environment. JEMSO are the coordinated efforts of EW and joint electromagnetic spectrum management operations (JEMSMO) to exploit, attack, protect, and manage the electromagnetic operational environment (EMOE). The impact of an EMOE upon the operational capability of military forces, equipment, systems, and platforms is referred to as electromagnetic environmental effects. It encompasses all electromagnetic (EM) disciplines to include electromagnetic compatibility; electromagnetic interference; EM vulnerability; electromagnetic pulse (EMP); electronic protection (EP); hazards of EM radiation to personnel, ordnance, and volatile materials; and natural phenomena effects such as sunspots, lightning, and precipitation static. At the national level, organizations and agencies such as the Central Intelligence Agency, National Security Agency/Central Security Service, National Geospatial-Intelligence Agency, and Defense Intelligence Agency are constantly seeking to identify, catalog, and update the electronic order of battle (EOB) of identified or potential adversaries. The joint intelligence operations center responds to theater-level EW-related intelligence requirements and forwards requests that require national level assets to the defense collection coordination center or other national-level organizations according to established procedures. The intelligence directorate of a joint staff (J-2) [at the subordinate joint force level] normally assigns one or more members of the staff to act as a liaison between the J-2 section and the IO cell where EW planners are normally assigned. At combatant commands and subordinate unified commands, the J-3 is primarily responsible for the EW coordination function. The EW division of the J-3 staff should engage in the full range of EW functions to include deliberate planning; day-to-day planning and monitoring of routine theater EW activities in conjunction with the combatant command’s theater campaign plan; and crisis action planning in preparation for EW as part of emergent joint operations. Since EW is concerned with attacking personnel, facilities, or equipment (EA); protecting capabilities and EMS access (EP); and monitoring, exploiting, and targeting use of the EMS (ES), EW staff personnel have a role in the dynamic management of the EMS, via tools and processes, during operations. A comprehensive and well-thought-out joint restricted frequency list and emission control plan are two significant tools that permit flexibility of EW actions during an operation without compromising friendly EMS use. The electronic warfare control authority, the senior EA authority in the operational area, develops guidance for performing EA on behalf of the JFC. Military operations are executed in an environment complicated by increasingly complex demands on the electromagnetic spectrum (EMS). All modern forces depend on the EMS. The EMS is the entire range of electromagnetic (EM) radiation. At one end of the spectrum are gamma rays, which have the shortest wavelengths and high frequencies. At the other end are radio waves, which have the longest wavelengths and low frequencies. The EMS is used to organize and explain the types of EM energy that exist in our world and throughout the universe. Devices whose functions depend upon the EMS are used by both civilian and military organizations and individuals for intelligence; communications; positioning, navigation, and timing (PNT); sensing; command and control (C2); attack; ranging; data transmission; and information storage and processing. The military requirement for unimpeded access to, and use of, the EMS is the key focus for joint electromagnetic spectrum operations (JEMSO), both in support of military operations and as the focus of operations themselves. 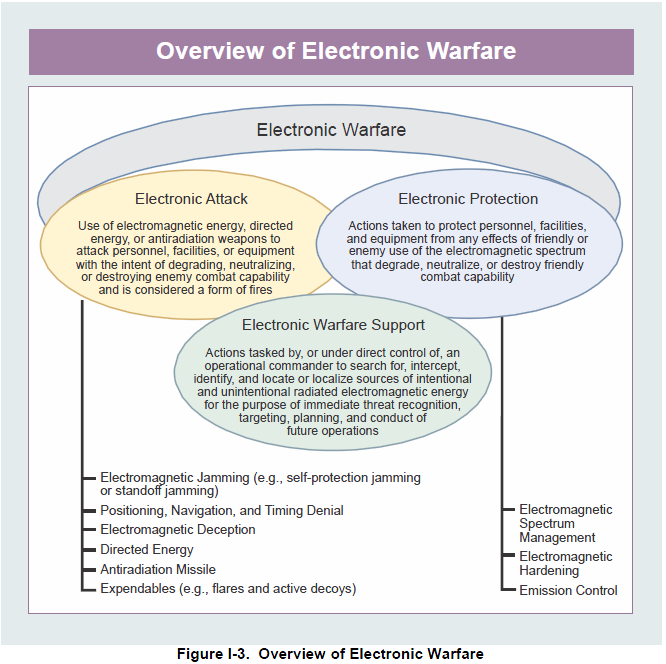 Electronic warfare (EW) is essential for protecting friendly operations and denying adversary operations within the EMS throughout the operational environment (OE).